Binge Worthy Book to Netflix Adaptations! This YA series turned Netflix movie tells the story of Lara Jean, who has never openly admitted her crushes, but instead wrote each boy a letter about how she felt, sealed it, and hid it in a box under her bed. But one day Lara Jean discovers that somehow her secret box of letters has been mailed, causing all her crushes from her past to confront her about the letters. Fans of the book series will be excited for the accuracy of casting and enjoy the subtle moments they were able to translate from book to screen. An unhappy tale about three very unlucky children. Even though they are charming and clever, the Baudelaire siblings lead lives filled with misery and woe. From the very first page of this book when the children are at the beach and receive terrible news, continuing on through the entire story, disaster lurks at their heels. This episodic adaptation just finished it’s third and final season which was overwhelmingly a success. The showrunners translated the wit of Lemony Snicket almost perfectly and the episodes were funny, exciting, and just a little bit macabre! In the twenty-fifth century, humankind has spread throughout the galaxy, monitored by the watchful eye of the U.N. While divisions in race, religion, and class still exist, advances in technology have redefined life itself. Now, assuming one can afford the expensive procedure, a person’s consciousness can be stored in a cortical stack at the base of the brain and easily downloaded into a new body (or “sleeve”) making death nothing more than a minor blip on a screen. Season two is slated to premiere sometime this year and we can only hope it will be as fantastic as the first season! Clay Jensen returns home from school to find a strange package with his name on it lying on his porch. Inside he discovers several cassette tapes recorded by Hannah Baker–his classmate and crush–who committed suicide two weeks earlier. Hannah’s voice tells him that there are thirteen reasons why she decided to end her life. Clay is one of them. If he listens, he’ll find out why. While the book and Netflix series create a discussion about mental health/suicide I’ve found the series does a lackluster job in bringing up suicide prevention and understanding warning signs. Jay Asher’s is a little more versed on the subject but unfortunately it’s one of those stories that’s started to become obsolete under newer and more educated stories about the same topic. #GIRLBOSS” proves that being successful isn’t about how popular you were in high school or where you went to college (if you went to college). Rather, success is about trusting your instincts and following your gut, knowing which rules to follow and which to break. The Netflix adaptation is wickedly funny if not a little over the top at points. Sophia is quirky and abrasive but as the show progresses you see her true personality shine through! Last but not least is the huge hit Bird Box! In a post-apocalyptic world, Malorie Hayes advises two young, unnamed children that they will be going downstream on a river in a boat. She strictly instructs them to not remove their blindfolds, or else they will die. Interweaving past and present, this story is a snapshot of a world unraveled that will have you racing to the final page or scene. Netflix reported that Bird Box had the biggest seven-day viewership for any of its original films to date, with over 45 million accounts, with views defined by the company as the film streaming for over 70 percent of its time! From page to screen the adaptation if decently faithful even though the story type has been done to death. The ratings are lower than you would expect for the amount of hype it attracted. Friendly Notice: The following post contains frank discussion and spoilers for the television mini-series Sharp Objects. The past two summers have gifted us with heady, visually intriguing mini-series based on powerful works by women. Last year’s Big Little Lies, an adaptation of Lynne Moriarty’s 2015 novel broached the topic of domestic abuse, violence against women, and the repercussions–expected and unexpected–of that violence. This summer, HBO aired Sharp Objects, an adaptation of Gillian Flynn’s 2006 debut novel. Both productions were directed by Jean-Marc Vallée. They are both visually stunning, sensual, scenic productions that manage to convey as much (if not more) through silence than most productions do with pages and pages and pages of dialog. Sharp Objects was a languorous, slow-moving southern gothic that made you feel sweaty from the sweltering heat portrayed on the screen. Amy Adams’ performance was the stuff of legends and deserves applause, awards, and accolades. There be spoilers ahead, Matey! (And let’s also note that we are talking about these shows as adaptations. While we understand that the book and its film are independent pieces of art, they can also be considered side-by-side, which we are doing here). Both Big Little Lies and Sharp Objects are the kind of stories where the ending redefine the entire story, forcing the reader to go back, rethink the story they have just read, and contemplate not only the truth that’s been lurking under the surface, but also about how their assumptions about “good guys” and “bad guys” affected their ability to recognize what was going on. They are clear, coherent, wonderfully intelligent, and thoughtful. However, one of the major themes that connect both shows are the plethora of headlines talking about the “abrupt” and “confusing” endings. So let me be clear: neither book has a confusing ending. In fact, they are both notable and noteworthy for the definitive statements they make about women learning to heal from trauma. Let’s stick, for now, with Sharp Objects, since it’s the freshest in my (and perhaps your) memory–and also because I’m more angry at it right now. In the book, journalist Camille Preaker is sent back to her hometown to investigate the murder of a young girl and the disappearance of another. From the beginning, we learn that Camille is depressed, self-harming (she carves words on her skin), and self-medicating with alcohol. We learn that her younger sister, Marian, the undisputed ‘favorite child’ died of an unknown or unspecified disease, leaving Camille alone and forced to cope with her narcissistic, manipulative mother Adora. Her return home refuels all the old tensions within her family, but now, Camille is focused on her half-sister Amma, some twenty years her junior, who is trapped with their mother and clearly coping badly. Amma lives a double life: she acts out, takes drugs, and drinks (among other problematic behavior) outside, but in her house, Amma regresses, becoming a meek, innocent child that their mother can care for and manipulate. Over the course of the story, we learn that Camille’s mother Adora suffers from Munchausen syndrome by proxy, or, as it is now known, Factitious disorder imposed on another–a condition in which a caregiver develops a long-term mental disorder of a type involving a breakdown in the relation between thought, emotion, and behavior, and harms the person in their care in order to be perceived as a helpful, saintly, martyr figure. Adora herself was responsible for the death of Camille’s sister and, indeed, nearly kills Camille and Amma by feeding them a tonic containing rat poison. The daughters are saved at the last moment, Adora is arrested, and Camille takes Amma to live with her. Things seem fine until a girl at Amma’s new school is murdered, and Camille realizes that Amma was the murderer of the two girls, driven to violent rage when she though that the girls were getting more attention from Adora than Amma herself. Distraught after Amma’s arrest, Camille uses a knife to carve more words into her back and very nearly begins cutting her face. She is saved by her editor, who takes her in. At the end of the book, Camille is living with the editor and his wife, and learning how to be part of a stable, loving family for once in her life. For the record, this is a very watered-down version of the plot, and you should still read it. The mini-series which aired on HBO (and concluded on Sunday) ends with Camille discovering vital (and horribly gruesome) evidence of Amma’s guilt concealed in Amma’s creepy-as-sin dollhouse. Abruptly, we see Amma standing in the doorway. She whispers “Don’t tell Mama,” before a brutally quick cut to the credits. The only indication we have about the reality of Amma’s actions are a series of rapid-fire, hazy cuts that implicate Amma and her two friends in the deaths of the girls in Windgap, and Amma alone in the death of her friend from school. The final shot of the entire episode is Amma’s face. There have been a number of critics who have taken issue with this ending for its style, for its glamorization of Amma’s cruelty, for its ambiguity. There is a lot to be said about this show, and this story, from the reality of female rage, the importance of telling women’s stories without pretense, or, indeed without needing male characters to justify their behavior. But what has gone largely overlooked here, is how it destroys the real power of Sharp Objects‘ ending. As we’ve pointed out here before, there is a troubling, pervasive trope of women victims in fiction–not only in mysteries, but they remain a primary offender. For time immemorial, we have been treated to the image of a women’s silent body, violated and harmed. We have been taught that women endure pain as a permanent condition–think of Miss Havisham forever in her wedding dress; or Bertha Mason in the attic; or any female ghost who ever haunted a house. Women are vessels for pain in fiction, and we are taught to see that pain as inescapable. Gillian Flynn flipped this trope on its head in Sharp Objects. From the beginning of the story, it seems that Camille is another damaged woman, trapped in her own pain. This is a character who quite literally carved her pain into her own flesh, making her skin both an armor against the world and a cage from which she can never (apparently) break free. In the show, we also learn in far more detail about the harm Camille endured as a result of the people in her town–yet another trap keeping her from healing. At the book’s end, however, we see that Camille has learned that there is a way out from the horrible cycle of illness, anger, self-loathing, and self-deception that her family and her town practice. She is given the choice and the opportunity to grow and heal–and she takes it. That opportunity, that choice, that hope, is taken away from her in the mini-series. 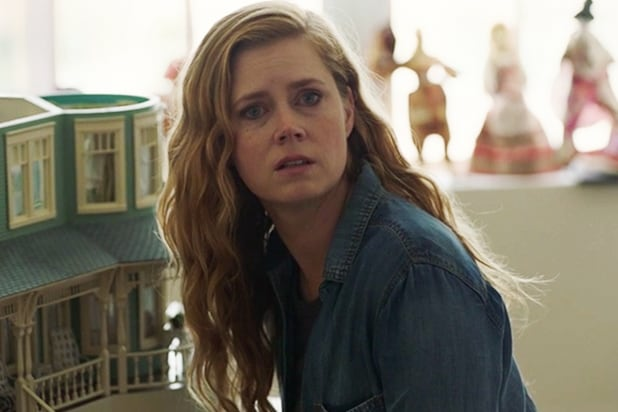 By giving us Amma’s face at the end of the show, Sharp Objects is no longer Camille’s story. Instead, she facilitates a story about Amma and Adora, and the ways in which violence destroys people, ruining the idea of a “pure victim.” This is not to say this is not an important trope. But to take away Camille’s hope is to perpetuate the notion that women in fiction (that women in general) suffer without resolution, and without real choice. To take away the book’s ending is to dilute the shocking feminist ending of Sharp Objects in favor of a far more problematic one. The miniseries states that women can be anything–victim, murderer, villain, or bystander. Again, this is fine. But the book says that women can change. And that is vital. Books on the Screen this Summer! Time was, beloved patrons, when summertime meant nothing but re-runs. Endless, unremitting re-runs of the shows we had enjoyed over fall, winter, and part of the spring. But the evolution of television has opened new opportunities for how we tell visual stories–from mini-series to movie-length adaptations, and where we tell stories. The internet has revolutionized the way we watch tv and film. Moreover, the diversity of channels and options has raised the bar on the quality of those shows, as well. So when we tell you that there are some sensational books coming to screens near you, you can be guaranteed these stories are the kind that will grip you, move you, scare you, and leave you hungry for more! The following are just a few of the books that are being adapted into shows that will be airing over the summer. We’ll be sure to keep you updated when these are available via DVD at the Library. And never fear–our round-up of movie adaptations will be along soon, too! Dietland: After author Sarai Walker saw the film Fight Club, she became determined to write the female version, investigating all the themes of gender and sexuality that Fight Club did from a feminine and feminist perspective. The result was her snarky, subversive, outlandish and fascinating debut novel about a woman named Plum Kettle. Plum works as a ghostwriter for the advice column of a wildly popular teen magazine. After years of failed diets, weight-loss programs, and dreams of being thin, she decides to make an appointment for weight loss surgery. But while she waits for her surgery date, Plum finds herself recruited by an underground feminist cabal known as “Calliope House”, a group that soon clashes with a guerrilla group known as “Jennifer”, who has been carrying out increasingly violent acts of vigilante justice against those who mistreat women. Used to a life behind a mask, Plum suddenly finds herself at the center of a sinister–and deadly–plot. This dark comedy has been turned into a show by AMC, starring Joy Nash and Julianna Margulies. It will begin airing on June 4, 2018. Little Women: Louisa May Alcott’s classic novel of the four March sisters has been made into yet another tv mini-series, starring Emily Watson as Marmee and the inimitable Angela Lansbury as Aunt March. We’ve had plenty of talks about Little Women here at the Free-For-All, and though it’s very much a product of its time in many ways, the book is also a remarkable story of resilience and determination that has encouraged generations of children to follow their dreams and believe in the power of love in its many forms. While I will personally be withholding judgement on this new adaptation for a little while, those of you willing to take the plunge into this new mini-series will find it airing on PBS beginning May 13. Sharp Objects: Readers of Gillian Flynn’s dark thrillers will already know the power and pull of her stories–and anyone who saw the feature film Gone Girl will remember the way she can trick, tease, and turn viewer’s beliefs upside-down. Now, we have the chance to see the adaptation of her dark, twisty tale of journalist Camille Preaker, who is sent on the hardest assignment of her life: back to her small hometown to investigate the murders of two preteen girls. Camille has spent years trying to live down the weight of her judgmental, hypochondriac mother, or recover from the guilt she feels for abandoning her younger half-sister–but now that she’s back in her old bedroom, and once again enmeshed in her family’s and her town’s drama, Camille begins to realize that the truth is far more complicated–and far more personal–than she ever imagined. This adaptation, starring Amy Adams, will be airing on HBO in June. C.B. Strike: Thought the title has changed a little, fans of J.K. Rowling’s Cormoran Strike series will feel right at home in this adaptation of the best-selling mystery series. After losing his leg to a land mine in Afghanistan, Cormoran Strike is barely scraping by as a private investigator: he’s in debt, his girlfriend has left him, he’s living in his office, and he’s down to his last client. But when Strike is approached by John Bristow, brother of a world-famous supermodel who recently fell to her death, he finds himself suddenly thrust into a world he never imagined. Bristow’s world is full of luxury, decadence, and seduction…but it also hides worlds of secrets, shame, and darkness that Strike needs to uncover before it’s too late. Based on J.K. Rowling (writing as Robert Galbraith), this show will begin airing on Cinemax in June, as well. So make some popcorn, beloved patrons, and prepare for a summertime’s worth of literary entertainment! Awards Season: The Bram Stoker Awards! It’s awards season this year, and we at the Library are thrilled to bring you all the winners–not just from last night’s Academy Awards, but from this year’s Bram Stoker Awards, which were handed out this weekend in Providence Rhode Island! Each year, the Horror Writer’s Association presents the Bram Stoker Awards for Superior Achievement, named in honor of Bram Stoker, author of the horror novel to beat all horror novels (and Free For All favorite), Dracula. The Bram Stoker Awards were instituted immediately after the organization’s incorporation in 1987. The first awards were presented in 1988 (for works published in 1987), and they have been presented every year since. The award itself, designed by sculptor Steven Kirk, is a stunning haunted house, with a door that opens to reveal a brass plaque engraved with the name of the winning work and its author. The Stoker Awards specifically avoid the word “best”, because it recognizes that horror itself is a genre that is constantly moving, changing, and pushing its own boundaries (and can often be very specific to a place, or a generation). Instead, it uses the words “Superior Achievement”. The categories of award have changed over the years, as well, as the genre has evolved, but since 2011, the eleven Bram Stoker Award categories are: Novel, First Novel, Short Fiction, Long Fiction, Young Adult, Fiction Collection, Poetry Collection, Anthology, Screenplay, Graphic Novel and Non-Fiction. We’ll have some more information regarding Stokercon, the annual meeting of the Horror Writers of America from one of our library staff who attended part of convention, but for now, let’s celebrate the winners (and maybe find some new books to enjoy?)! Check out all the winners of the 2017 Bram Stoker Awards here! For those of you still having feelings about Superbowl LII…we see you, and we support you. For those of you good readers who watched the Superbowl for the commercials, it was a pretty decent showing, all in all. Particularly those Tide ads, that played heavily on genres, tropes, and gimmicks within familiar commercials. Silver on the Road: Readers who are taken with scenes of the ‘Wild West’ in Westworld, and intrigued by the idea of women finding their identity while traversing it, look no further than Laura Anne Gilman’s sensational Devil’s West series. The series is set in a fantasy west, ruled by The Boss…some might call him the Devil…and full of spirits, stories, and other things too terrible to name. On her sixteenth birthday, Isobel decides that her true calling is in working for The Boss. In turn, she is made his Left Hand–but what that title truly means is a mystery. Rather than explain, The Boss places Isobel in the company of a man named Gabriel, and sent to explore the territory that is now hers. The story that unfolds is a gently-paced, deeply emotional, and utterly vivid one, that will have you trying to brush the dust from your coattails after every scene. Isobel’s comradeship with Gabriel is fascinating, unexpected, and stunningly equitable, the lessons she learns about herself and her role along the road are unforgettable, and the best part is that this is just the first book of an outstanding series. So anyone looking for a Wild West that is just as weird as Westworld, but with a lot more occult and feminism thrown in, look no farther that this book. Karen Memory: Elizabeth Bear takes inspiration from the very real Seattle Underground to create a story about airships, gold miners…and, most importantly, Karen, and her fellow “soiled doves” working at Madame Damnable’s high-quality bordello. When a badly injured young woman arrives on their doorstep, pursued by the man who holds her indenture, Karen realizes that trouble has fixed its eye on Madame Damnable’s. But when a body is soon left on their rubbish heap, all hell seems near to breaking loose around them. While the steampunk genre deals less with robots than automatons (the distinction can be found in the power keeping the machines working and, often, the level of autonomy and consciousness afforded to them), there is a lot of the same high-tech, Wild West skull-duggery going on in this sensational story as in Westworld. Best of all, once again, we get a feminist perspective on violence, history, and tech, that is heartily welcome. Utopia: Lincoln Child has terrific fun with the tech-thriller genre, and this book, set in a futuristic theme park, deals with many of the same themes as Westworld, including huge conspiracies, techno-wizards and techno-pocalyspes, and elaborate sabotage schemes going on behind the idyllic scene. Utopia is a technologically advanced, family-friendly theme park off the Las Vegas strip. Not only do people flock there for a day of fun, they come to see the system known as the Metanet, a highly secretive and enormously ingenious robotics system designed by Dr. Andrew Warne–a system that essentially runs the park on its own. But when Andrew is brought in to consult on the possible expansion of the park, he soon uncovers evidence of tampering with the system–from the inside. His worst fears are realized when one of the rides is sabotaged–and park officials are unable to turn off the rest of the park due to threats of further violence. Full of fancy techno-details that will appeal to those who love programming potential in Westworld, and told in a thrill-a-minute, breakneck pace, this story is sure to feed your need for danger until Westworld surges back onto the screen. FantasticLand: This one is a bit of an outlier, but for those of you drawn to the premise of an amusement park from hell, look no further than Mick Bockoven’s vivid, violent novel about an abandoned theme park–and the people who were abandoned inside it. When the (fictional) Hurricane Sadie threatened Florida with inevitable destruction, the decision was made to evacuate visitors from FantasticLand, but to leave park staff behind with some supplies in order to hold down the fort, so to speak. But when help finally arrives five week later, they find gruesome and visceral evidence (literally) that something went terribly wrong at FantasticLand. This book is presented as a dossier of testimony from survivors about what precisely happened during those weeks, when the staff broke into tribes–complete with names and mottoes–and began hunting each other. There are a number of echoes of Lord of the Flies in this book, and though there is a lot of Milennial-bashing in Bockoven’s work, this is just the thing for a reader whose looking for another dystopian theme park full of menace to tide them over until Westworld‘s gates re-open. Books–Coming to a Screen Near You! How do we feel about film adaptations of books, dear readers? To be honest, I don’t have a personal consensus about this issue, so I doubt we as a group are going to come up with a unilateral stance. If Games of Thrones has taught us anything, it’s that books can be adapted well…and that they can also get in the way of the books (figuratively and literally!) just as easily. On that note…stop toying with us, George R.R. Martin. We are suffering enough. Anyways, there are precious few adaptations that I enjoyed more than the books–like The Painted Veil with Edward Norton and Naomi Watts, as I think I’ve mentioned previously here. It’s difficult (as I know we’ve discussed here) to stuff a many-hundred page book full of literary symbolism, sensory detail, and emotional descriptions into a two-hour film. Yet books still form the basis of a significant number of films and tv shows, precisely because they come with so much insight, intrigue, and development pre-packaged. And, regardless of what Some People say about the death of literature, there is clearly a devoted following of literary fans who make these shows and films popular, and create the drive to make more. So here, for your reading and viewing pleasure, are a few of the bookish film adaptations that have been discussed recently. Feel free to air your opinions on them here, and to come into the Library and check out the books before they hit the screens, so as to taunt your friends and family with non-spoilery spoiler hints for months to come! Little Women: I love Little Women. My adoration of this book, of Louisa May Alcott, and of her family, has been well-documented. And for that reason, I personally cannot bear another adaptation of the book, even if it is PBS Masterpiece putting it all together. It’s like having a little bit of my soul taken out and manhandled by a major production company. Nevertheless, there are a lot of people who are genuinely excited about this one, and I want there to be a really good adaptation on film, so I can only hope that this is the one that will prove that Little Women can be made into a meaningful, timely, and non-hokey production (if you’ve seen the BBC adaptation from the 1960’s, you know what hokey looks like). As the Masterpiece website notes, “Little Women is a truly universal coming of age story, as relevant and engaging today as it was when originally published in 1868″, and we need those messages of hope, of strength, of determination, and of everyday feminism and female support that the March sisters learn from each other during their coming-of-age. So please, please, please, Masterpiece, get this one right. On the plus side, Angela Lansbury, Tony Award winner and creator of my personal heroine Jessica Fletcher, is slated to play Aunt March. I will tune in for that, if for no other reason. Alias Grace: No doubt the huge popularity of The Handmaid’s Tale, convinced the Powers That Be that adaptations of Margaret Atwood’s books were a good idea. No doubt Margaret Atwood’s stunning writing and incredible insight helped, as well. Though one of her lesser known works, Alias Grace is another fascinating (and feminist) book that centers on the 1843 murders of Thomas Kinnear and his housekeeper Nancy Montgomery in Canada. Two servants of the Kinnear household, Grace Marks and James McDermott, were convicted of the crime. McDermott was hanged and Marks was sentenced to life imprisonment. Atwood’s tale is told by the fictional Doctor Simon Jordan, who is ostensibly researching criminal behavior, but finds himself swept up into Marks’ story, and the paradox of the mild-mannered woman he knows, and the horrors she is supposed to have committed. This new adaptation of Alias Grace will air in Canada beginning in September and will be streamed to Netflix afterwards. For those eager for a taste of what’s to come, take a look at the trailer here. So what say you, dear readers? How does it feel to watch books on the screen? Are there any adaptations you’re eagerly awaiting?